Offering you a complete choice of products which include crane roll brake lining, industrial brake lining for oil based use, industrial friction sheet and industrial roll brake lining. Industrial band and drum brakes, Industrial band, plate and cone clutch linings (eg. cranes, lifts, excavators .winches, concrete mixers, drop hammers, mine widening appliances, underground haulages, tippers, oil well draw works, road rollers, sugar mill centrifuges), certain heavy road transport vehicles and tractors. Industrial woven and flexible roll brake linings with wire reinforcement are available in various thickness and lengths. Industrial Brake liner Feroda Compo Type WA8, flexible, roll lining, solid woven is asbestos based with brass wire content. 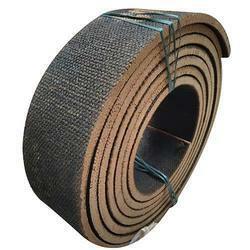 Flexible Roll Brake lining COMPO WA 8 solid woven, asbestos based friction material made from asbestos yarn, spun around brass wire, which contributes considerably to its strength. WA-8 has a medium/high co-efficient of friction combined with moderate temperature and wear resistance. WA-8 is available in Roll form. Segments, Cones and special shapes can easily be cut from it. Being a flexible material, it is possible to form it to radius when fitting it. Forming can be made easier by placing the material in an oven at a temperature of not more than100°C (212°F) until it has heated throughout to soften the impregnant. WA-8 is designed solely for use under dry conditions (i.e. it is not suitable for use in oil). WA-8 can also be supplied with both surfaces ground. hardness of 200 or more may be used. 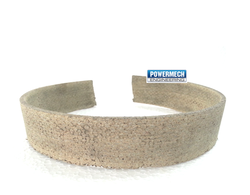 Our company is engaged in manufacturing and supplying Industrial Brake Lining for Oil Based Use. The proffered compilation is suitable for usage under oil-based conditions, and can be used dry as well. Oil immersed brakes, earth-moving equipment, agricultural machinery and plate & cone clutches for industrial usage, are some of the major application areas of the proposed range. 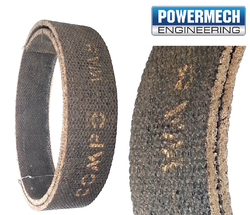 COMPO WASM 80 is a clutch facing material having a woven asbestos base with metallic inclusions in the form of brass wire. It is impregnated with an infusible bond capable of withstanding reasonably high clutch temperatures. 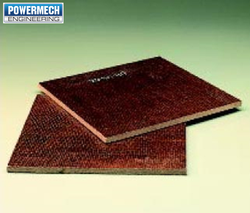 It has a medium coefficient of friction, combined with good resistance to temperature and wear. General engineering applications Tractor main engine clutches. Owing to vast industrial experience and knowledge, we are engaged in offering a best quality collection of Industrial Roll Brake Lining to our prestigious customer. These industrial roll brake linings are supplied to cater to the needs of Industries such as Engineering, Mining, aerospace, Steel, Chemical, Petrochemical, Fertilizer, Power Generation and Ship Building. These industrial roll brake linings can be avail from us at reasonable rates to our valued customers. The offered industrial roll brake linings are sturdy construction, excellent in finish and alluring in patterns. Looking for Brake Lining ?